Summer is coming and at the request of my daughter, my project this month is an addition to her summer wardrobe. I had some "board short" material that I got on clearance for about $4/ metre last fall and have been saving it for a fun summer project. It is bright purple with a fun leaf and floral print. I let my daughter go through my collection of patterns and pick her favourite. 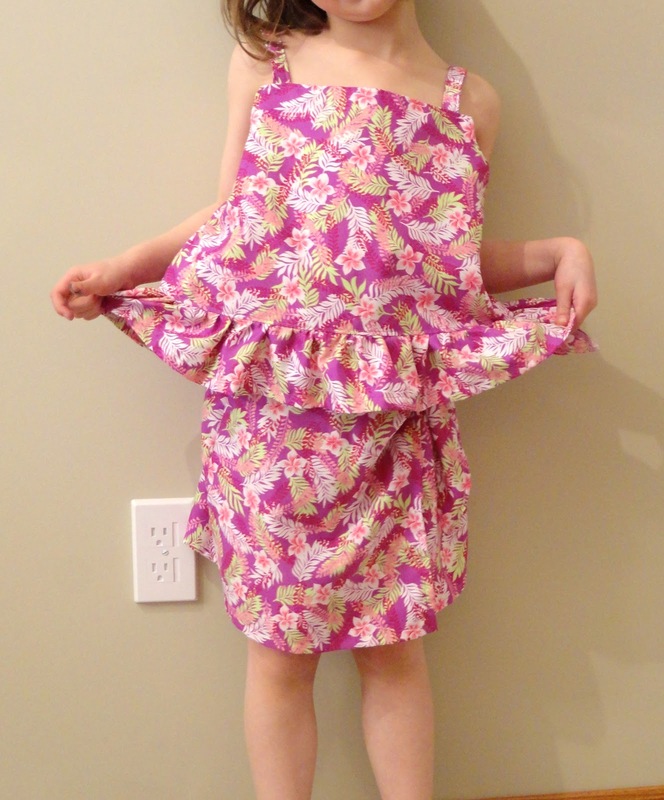 She picked out Butterick 3832, a really cute summer skort set with a ruffled tank. I did make the shirt a little longer so that her belly would not stick out when she was playing. It took about 2 hours to make from start to finish (including cutting time) and she is thrilled. She can wear it together on it's own, as a bathing suit coverup or use the pieces separately with other things in her closet. I though it was a lot of fun to make and the best part of this project is how happy it made my daughter.